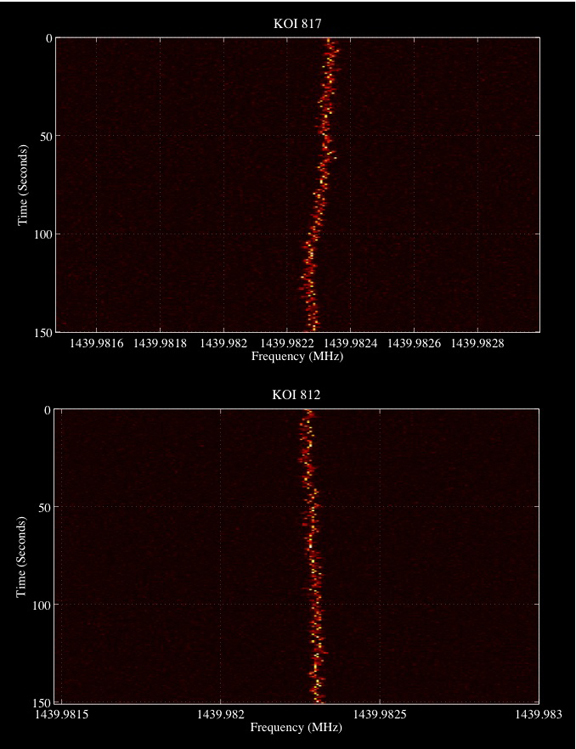 We've started searching our Kepler SETI observations and our analyses have generated some of our first candidate signals. 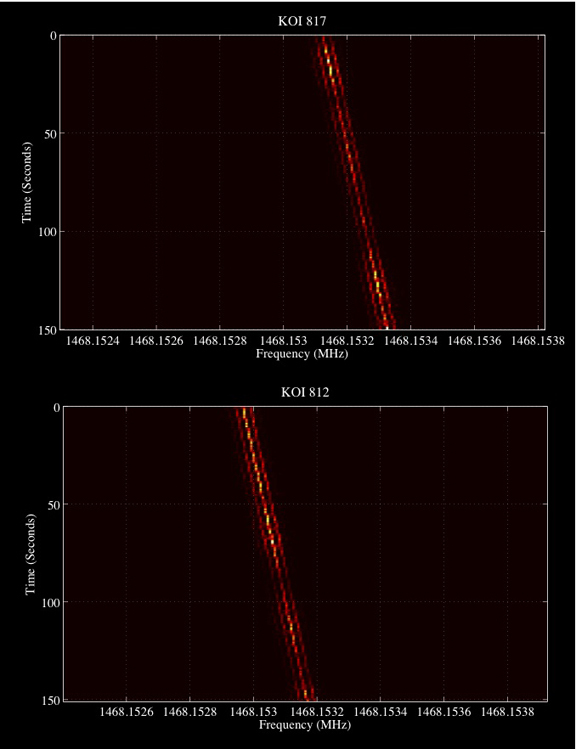 Each of the signals below is shown in a pair of plots, one from an observation of Kepler Object of Interest (KOI) 817 and one from an observation of KOI-812. During an observation, we alternated between targets to enable us to rule out signals seen coming from two different places in the sky. If we see a signal coming from multiple positions on the sky, like the ones below, it is very likely to be interference. The signals below are undoubtedly examples of terrestrial radio frequency interference (RFI). What do these plots represent? These are plots of electromagnetic energy as a function of frequency and time. Brighter colors represent more radio energy at a particular time and frequency. For example, a radio station transmitting at 101.5 MHz would produce a large amount of energy near that frequency. Why are these signals interesting? These signals look similar to what we think might be produced from an extraterrestrial technology. They are narrow in frequency, much narrower than would be produced by any known astrophysical phenomena, and they drift in frequency with time, as we would expect because of the doppler effect imposed by the relative motion of the transmitter and the receiving radio telescope. These first results are tests of the algorithms we'll apply to all our observations of Kepler planets. During the coming weeks, we'll be posting more of our results as we process the nearly 50 TB of data we collected in early 2011.